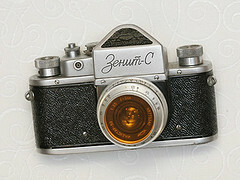 Zenit cameras (sometimes badged in Cyrillic, ЗЕНИТ or ЗeHuḿ) were made by the KMZ factory near Moscow. 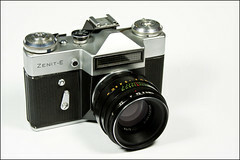 The original Zenit is an SLR based on the Zorki rangefinder (itself based on the FED, which is a copy of the Leica II). 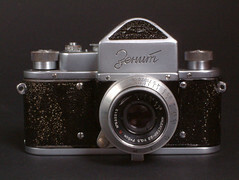 The first few Zenit cameras have a 39 mm screw thread lens mount, exactly like that of the Zorki. The differences between the screw thread and that of any Leica-mount lens are trivial, but the SLR Zenit has a deeper body, to accommodate the mirror, so lenses made for the early Zenit are correspondingly shorter. Leica-mount lenses will fit on the camera, but the focus scale will be incorrect, and the lens will only focus at close range (the converse situation, a Zenit M39 lens mounted on a Zorki, is even worse; the lens only focuses 'beyond infinity', i.e. not at all). 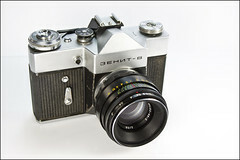 The early Zenit lenses are sometimes described as having a 'Zenit M39' mount to distinguish it from the more common Leica thread mount). 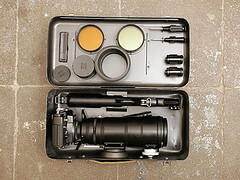 Some Soviet lenses such as the Industar-50 can be found with an extension tube allowing the same lens to mount on a Zorki (with the tube) or an M39 Zenit (without it). 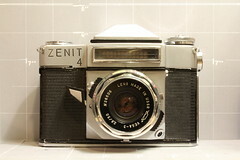 Later Zenits have an M42 screw lens mount; they have the same film-to-flange distance as the 39 mm cameras, so that, with a very simple thread adapter, the early lenses can be used on M42 bodies. KMZ cameras at Collection Appareils by Sylvain Halgand (in French). 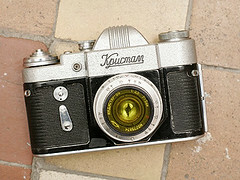 Russian camera instruction manuals, PDF format, in English including various Zenits on Mike Butkus' Orphan Cameras. 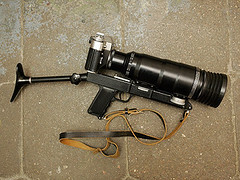 JM Burtscher's Sovietcamera website (in French) (archived). This page was last edited on 13 December 2017, at 01:13.